A few weeks ago, my DH and I went up to Tagaytay with my in-laws to celebrate our 3rd year anniversary. It was complete R&R for both of us, so we didn't have a chance to go around Tagaytay as much as we would have liked. 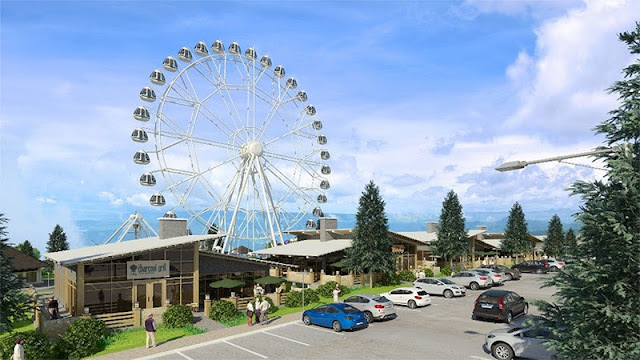 Recently, I read about a recent development in Tagaytay by SM Land called the Sky Ranch from Letsgosago. I found out that this is a good place for family fun. SM has envisioned this to be a leisure park with lots of activities in store for kids and adults. They have horseback riding, a mini-amusement park and their main attraction called the Sky Eye. The Sky Eye is currently the country's tallest ferris wheel, which stands at 207 ft. For those who loves scenic views from above like me, you will definitely enjoy this one. The next time we visit Tagaytay with all our kids, we will definitely visit the Sky Ranch.